I worked super hard, got an MBA and climbed to the top of my profession in corporate marketing – corner office, board room, all that. I came across as smart, confident, strong. From the outside, my life looked picture-perfect. Truth is, I was slowly dying on the inside. I wouldn’t let anyone get too close to me for fear they would see the truth of my life; they might see the loneliness that had taken up residence in my heart. I put on a pretty good act for a really long time. Truth is, I was avoiding being home where I felt empty. I kept running toward that corner office instead of facing what I was feeling. Why was I so successful in my professional life and so completely unsuccessful in my personal life? If I could work hard and create almost anything I wanted in my career, then why couldn’t I create an intimate, soulful connection with a kind, loving man? 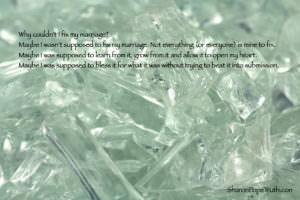 If I was so damn smart, how come I couldn’t fix my marriage? Maybe giving all my focus and attention into my soul-sucking marketing career, rather than my marriage was the issue. Maybe…. Maybe it’s because I married someone for safety – someone I knew wouldn’t hurt me, so I could feel safe and secure in my picture-perfect life, but not necessarily in love. That could be it…. Maybe it’s because I hadn’t allowed myself to be seen….or experienced…or vulnerable…or soft. And I didn’t look for that in him. Yea…that had to play a part in why I couldn’t fix my marriage. And maybe it was because my marriage wasn’t supposed to be fixed. and to allow love and love lost to bring me to the point of surrender, so that I can serve in this way as a Love Coach. Maybe I wasn’t supposed to fix my marriage. Not everything (or everyone) is mine to fix. Maybe I was supposed to learn from it, grow from it and allow it to open my heart. Maybe I was supposed to bless it for what it was without trying to beat it into submission. As a coach, I have the tools to bring strong, confident, smart and lonely women through this forest. And as a woman I know what you’re feeling. I know what you’re experiencing day-in and day-out.